The Dow fell 365 points Wednesday, primarily driven by fears about the ongoing oil price plunge and the effects of China's currency devaluation, experts say. The S&P 500 was down 2.5% and the Nasdaq lost 3.4%. All three indexes are now in correction, which means they have all tumbled 10% or more from their recent peak. The Dow, for instance, hit its all-time high of 18,351 on May 19 and is now down 12% from that level. As oil prices continued to hover around the lows, it "is putting pressure on equities," said Art Hogan, chief market strategist at Wunderlich Securities. 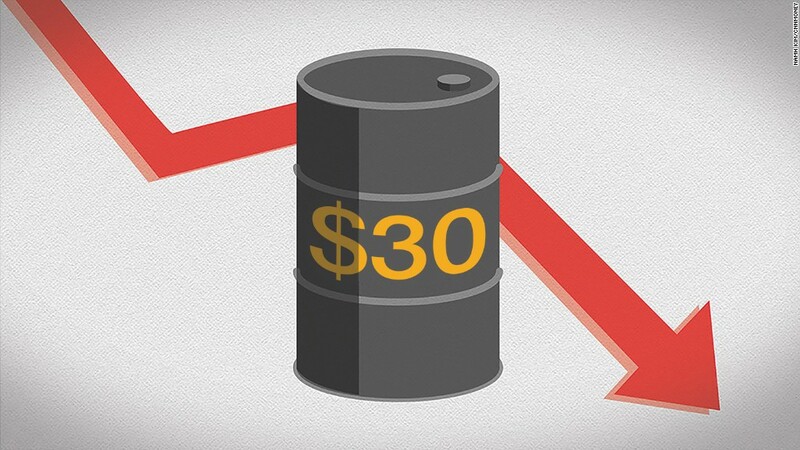 Oil prices fell under $30 a barrel Tuesday for the first time in 12 years. On Wednesday, oil hovered around $30.40. The uncertainty over oil prices caused energy stocks in the S&P 500 to decline 1.7% Wednesday. Energy firms Freeport-McMoRan (FCX) and Marathon Oil (MRO) were among the worst performing stocks Wednesday, both down around 9%. The volatility rocked some of the best performing stocks of last year: tech and consumer discretionary. Netflix (NFLX) was down 8.6%, Amazon (AMZN) fell nearly 5.8% and Google (GOOG)'s stock declined about 3.4%. All together, tech stocks fell 3.5. Consumer discretionary stocks got hit hard too. Starbucks (SBUX) was down 2.7%, Home Depot (HOME D)fell 4.8% and McDonalds (MCD) was down 2%. Hotel stocks like Marriott (MAR) and Host Hotels and Resorts (HST) both fell over 6%. Another key factor looming over U.S. stocks is China's slowing economy and uncertainty over how much its currency, the yuan, will devalue. Already in 2016, the yuan has lost 1.2% of its value against the dollar. It's not the worst performing currency, but the yuan's losses are forcing other currencies to devalue as well, raising concerns about the health of the already-battered global economy. "The biggest concern that we have coming into the next year is what China is doing with their currency," says Hogan.